On The Devolution Of Culture, 2014, installation view detail including work by Hayley Tompkins, Steven Claydon, Ricky Swallow, Alex Frost, Jason Dodge and Simon Martin. Image courtesy Rob Tufnell, London. Photo: Andy Keate. On The Devolution Of Culture, 2014, installation view detail. Image courtesy Rob Tufnell, London. Photo: Andy Keate. 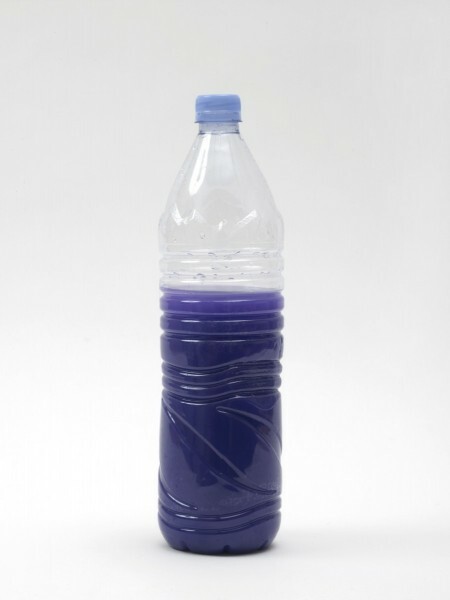 Hayley Tompkins, Untitled, 2014, bottle, water, watercolour paint, On The Devolution Of Culture, 2014, Image courtesy Rob Tufnell, London. Photo: Andy Keate. 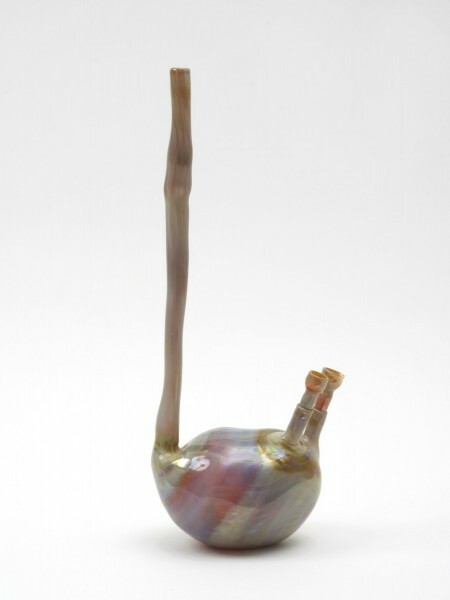 Francis Upritchard, Plant Bong, 2005, blown glass, On The Devolution Of Culture, 2014, Image courtesy Rob Tufnell, London. Photo: Andy Keate. Andy Holden, Pessimism of the Intellect, 2014, vinyl 78, collage, watercolour, 2014, On The Devolution Of Culture, Image courtesy Rob Tufnell, London. Photo: Andy Keate. 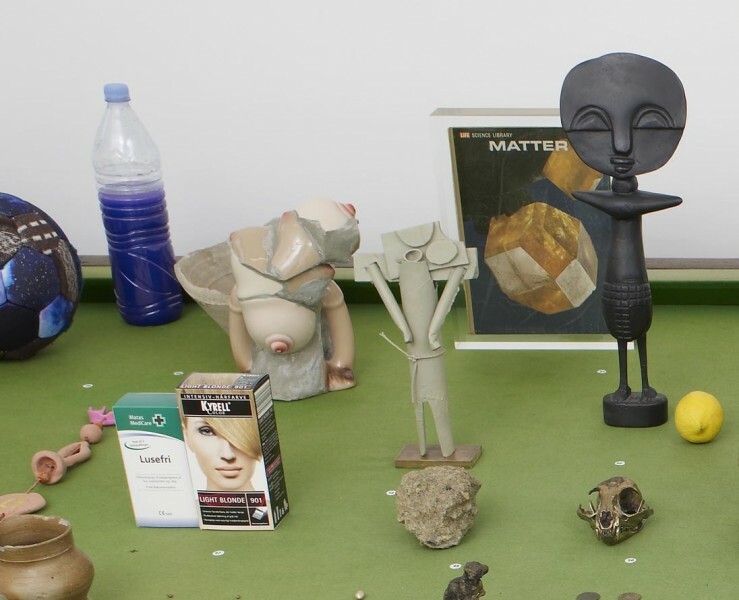 Rob Tufnell’s gallery – for those who have yet to visit – is located just a five-minute walk from Tate Britain, in the direction of Horseferry Road. It occupies one of the rather lovely neo-classical pavilions that punctuate the chequerboard social housing blocks that Edwin Lutyens designed between 1929 and 1930. The street itself is one of London’s hidden architectural gems and is worth a visit in its own right. Into this diminutive gallery, with ship-in-a-bottle sleight of hand, Tufnell has fitted a full size billiard table: a massive, heavy Victorian beast of a thing, covered with gently faded baize. 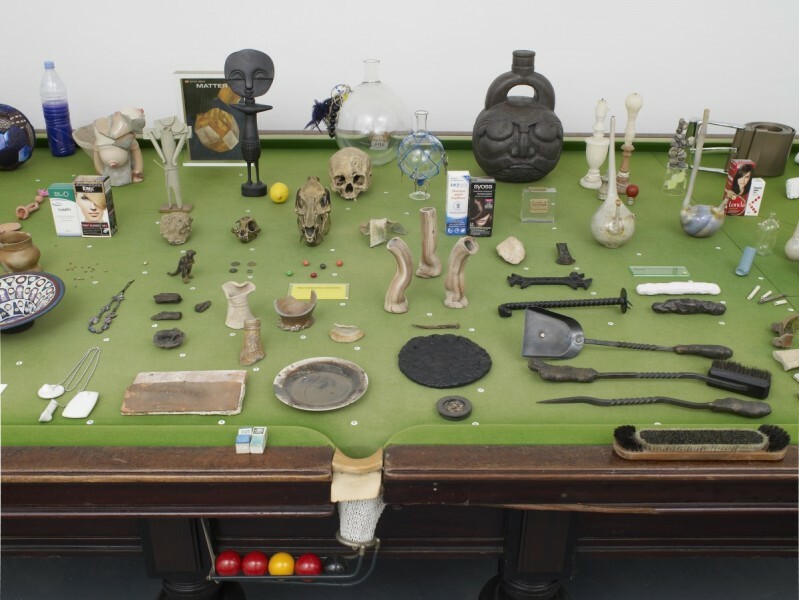 Populating the entire surface of the table is a plethora of objects: artworks and archaeological artefacts sit side by side, waiting for the viewer to make sense of them. Cubes of blue cue chalk sit on the edge of the billiard table, and in the mind’s eye one could imagine cannoning billiard balls from one object to another, finding meaning in the geometry of each shot and ricochet. The conceit of this show is that it borrows a “display strategy” from the great 19th century anthropologist/archaeologist Henry Pitt Rivers. An archival photograph exists showing Pitt Rivers laying out portions of his collections on his own billiard table. The title of the exhibition purposely misquotes his famous 1875 lecture “On the evolution of culture” which posited a Darwinian theory in relation to culture as something which naturally refined or improved itself over time. This theory connected to views concerning race that are now, and even at the time were, wholly unacceptable. Tufnell’s exhibition explicitly rejects any notion of cultural progress and “celebrates dysfunction, redundancy and crude fetish” in a survey of contemporary sculpture in microcosm. So, what do we have? A group of exquisite, but troubling, hand-blown glass vessels by Francis Upritchard, none larger than the size of a lemon, and each with eccentric and non-functional handles, sits next to a tiny Roman glass perfume bottle. 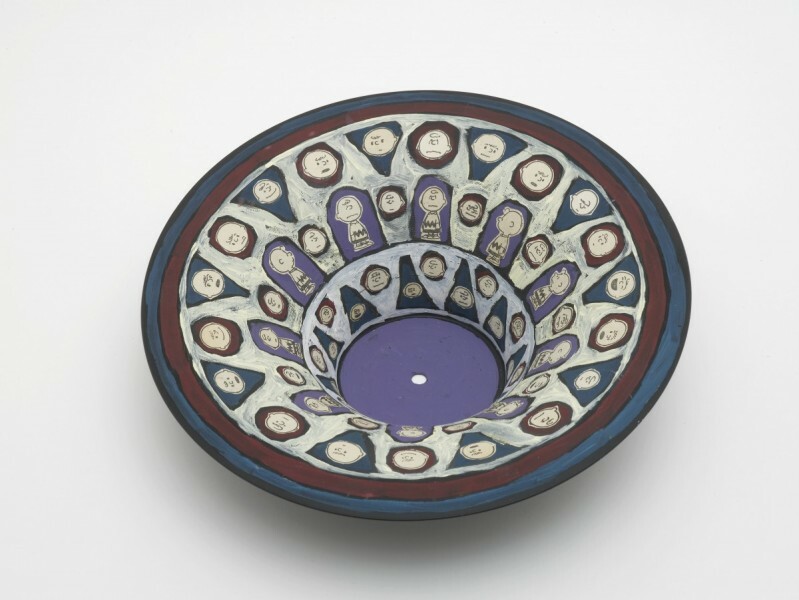 Nearby, sherds of Medieval German stoneware excavated from the mud of the City of London have faces inscribed in them that recall Upritchard’s totemic ceramic works. Millennia collapse as you look from one to another. At the back of the table is perhaps the largest object here, a fantastical, dark ceramic piece by Steven Claydon. An entirely useless, capped-off drinking vessel, its round form a boggle-eyed and bearded face, this charismatic artefact is called Chug (arrested equivalent), 2012. Jim Lambie has contributed an outsize belt, coiled up as if by a tidy giant, and Ricky Swallow has a jolly little bronze titled Standing Figure (baby), 2013, that taps an aesthetic somewhere between voodoo and Blue Peter. A cluster of broken, or cracked 19th century clay pipes sit adjacent to Keith Coventry’s cast of an inhaler, used as a crack pipe – geddit? LOL. There is a group of primitive hand tools variously from the stone, bronze and iron ages; medieval floor tiles and an anglo-saxon skull, a 19th century boat nail and fragments of timber from a Roman barn. Magali Reus’ Untitled, 2014, is a burnt pizza encapsulated in resin – entirely perplexing, in a good way, as is Roger Hiorns’ work, also Untitled, 2014, which consists of a lump of concrete covered in calf brain matter. I could go on and on. The show boasts 75 rather extraordinary exhibits and richly rewards long and enjoyable scrutiny of the sometimes whimsical connections between them. This is a real treat, and a perfect exemplar of Rob Tufnell’s laconic, witty erudition.